Sticker Genius offers a fantastic product to increase revenue for your next golf outing. Our Custom Golf Cart Graphics allow you to sell cart sponsorships in addition to the standard sponsor opportunities. Most golf outings raise money by asking local businesses to sponsor different areas of the event and in return, the outing is free advertising for their businesses. Sticker Genius can assist with your outing by providing multiple material options and customizable designs to fit your specific promotional needs. All of our Custom Golf Cart Graphics are printed on durable and high-quality materials, that will never cause damage to the surfaces that they are applied to. Sticker Genius Custom Golf Cart Graphics will provide an inexpensive way to generate additional sponsorship dollars at your next fundraising event. 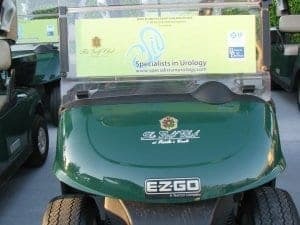 Additional “cart sponsorships” are a great alternative to pricey hole sponsorships and make a bold statement when displayed on the front of the golf carts. Some tournaments have started selling cart signs as a package deal to a key sponsor who provides a large dollar amount and wishes to sponsor all the carts for your tournament, but these golf cart stickers could also be ordered separately “per cart” for smaller or lower budget events. These branding signs can also be used for sponsorship of tournament beverage carts or in other areas around the course. Custom Golf Cart Stickers are a great way to brand your event and make it stand out from all those other outings! Get creative by designing unique, one of a kind advertising and promotional materials. Our extremely popular truly reusable StickleMe material is a vehicle (and golf cart) safe and will never damage paint. This can be a very valuable asset to your event as the golf carts at many courses are leased, not owned. In addition, these amazing golf cart stickers will stick to almost any surface, which allows your marketing options to be nearly endless. Which is why you can find our golf cart graphics proudly displayed in some of the more prestigious golf clubs and resorts in North America. These courses, as well as the tournament host, have raved about the quality and impact they provide! 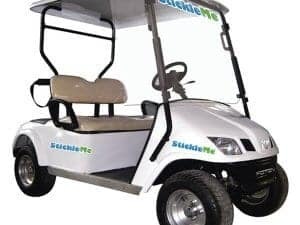 Most importantly, the events that have used our reusable golf cart stickers have found they can raise a lot more revenue by using our reusable and restickable branding options.